Guy Alfred Clumpner was elected President of EWGS in 1958, and served only four months till his death April 21, 1958. Guy was born June 13, 1887 in Viroqua, Wisconsin, son of Alfred Eugene Clumpner (1857-1961)and Jennie (Allen) Clumpner. (1867-1949). Guy's grandfather William Clumpner was born in Holland 1836 and died in Wisconsin 1911. Guy married Helen Woodward Browne August 15, 1914 in Michigan. Helen was a school teacher and so was Guy. After they were married they took a train to Riverside, Washington where Guy became first a Principal and later Superintendent of Schools at Conconully Washington. The moved several times after that first to Brewster, and Winthrop in Washington, then Harrison and Kellogg in Idaho, Rosalia, Clarkston, Moxee City, Rainier, Orting, and Puyallup in Washington. Finally settling in Spokane. He sold insurance for a while and then went back to teaching at Moran Prairie and Elk, Washington before retiring in 1956. Guy and Helen had five children Alfred Browne, Eugene Rawson, Edward Bruce, William Henry and Benjamin Hugh Clumpner. Alfred Browne was a bomber pilot over Germany in WWII and died when his bomber was shot down. Helen Woodward Browne was born July 25, 1888 in St. Louis, Missouri and died in Spokane July 27, 1965. She was a descendant of Samuel (1787-1856) and Dorcas (Jordan)(1794-1866) Brown from New Hampshire and Maine, and Rufus J. (1798-1842) and Leah (Wetherell)(1798-1842) Woodward both from Maine. Helen was a member of the Esther Reed Chapter of the DAR. 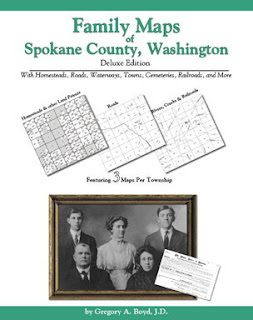 The Family Maps series of Land Patent Books are published county by county, state by state, for original settlers whose purchases are indexed in the U.S. Bureau of Land Management database. For the first time, you can locate your ancestor's federal land purchase by simply finding them in a surname index, then an all-name index, which directs you to a map of first-land-owners. And now you can learn who your ancestors' neighbors were! The Family Maps books are a helpful visual reference tool that make your federal lands research easier than ever. Each Township has a Patent Map, Patent Index, Road Map, and a Map we call an Historical Map, which includes Waterways, Watercourses & Railroads. The Road and Historical Maps also include the City-centers and cemeteries that can be found at NationalAtlas.gov. There is also a Surname/Patent Index and a Surname/Township Index to help you dive into the right area of the County. Included Appendices identify multi-Patentee buying groups and also list the numerous Aliquot (section) parts you might find. Attorney, genealogist, and software engineer, Gregory A. Boyd, has mapped the federal land patents (original land-owners) contained in the indexes of the Bureau of Land Management and Arphax Publishing brings you the resultant new books each week. Each volume provides you maps of indexed federal land patents for a county, with one map per Congressional township. Also included are two additional maps per township that geo-reference the land-tracts to existing roads, waterways, communities, cemeteries, railroads, etc. The Patent Maps are essentially plat-maps, but contain first land-owners, no matter what year they acquired the tract. This series provides the best tool ever for re-constructing frontier neighborhoods, migration-patterns, and devising maiden-name possibilities. Many "burned" counties magically become researchable, thanks to these tools being generated from Federal records. These titles are held in the Genealogy Room on the third floor of the Downtown Branch of the Spokane Public Library at 906 W. Main Avenue. With the branch now being open on Mondays, you will have even more opportunities to utilize the many genealogical resources there! Spokane Public Library’s Downtown branch will resume offering Monday open hours starting Monday, January 25. The branch will be open 10:00 am – 6:00 pm; the Northwest Room will not be available on Mondays. The Downtown Library has been closed on Mondays since the beginning of 2005 when severe budget cuts caused hours reductions at all library branches. Library customers have been unhappy about the lack of Monday hours since then and the Library’s administrative staff and board have been diligently working to restore hours at all branches. Last year, Monday hours were added to the busiest branches: South Hill and Shadle. Downtown follows suit this year. The Library is able to add the Monday hours Downtown with no additional funding. Reallocation of staff and greater use of self-service options by customers make this addition of eight hours weekly possible. This is the thirteenth in the series on the Presidents of EWGS leading up to the 75th anniversary in 2010. See the previous posts on Samuel Pool Weaver, Leora Cookingham Thiel, Susan Marie West Jack, Ruth Churchill Austin, Alfred Denman, Florence Ballou Brown, Harriet Jefferson Pinkham, Mary Elizabeth Dow Maltbie and Achsah Maltbie Rawlings, Lee DeGolyer Patchen, Susie Elliott Faubion and Edith Webb Nelson. Carrie Teats Lartigue started researching her family in 1953 and stumbled around for more than a year before she heard of EWGS and joined in 1954. Carrie was born at Peck, Lewis County Idaho, daughter of George Henry and Anna (Kole) Teats. She married twice, Jack Fannon was first and they had one son Jack L. Fannon. She married second Weston L. Lartigue. He was born at Golden, Jefferson County, Colorado, son of Henry Clay and Elizabeth (Dailey) Lartigue. She was a member of Esther Reed Chapter of DAR, IOOF and Mission Avenue Presbyterian Church. Volume 16 page 11 of the EWGS Bulletin has an article on Carrie titled Carrie Who?. We all know Carrie Lartigue - or do we really? She is that lady with the twinkling eyes and contagious smile; the one that is so quiet you don't really notice that she is around but whose presence is felt in all of the activities of EWGS. She joined the society in 1954 and has been a continually active member longer than any other. She has been a major factor in the growth and success of the society. She knows the "jobs" do not get done by themselves but require individual and group efforts for successful completion. Many of the projects for the society have been carried out personally by her, other projects with the help of her late husband, Weston, and still other projects with the assistance of other volunteers. This picture is of a group of cemetery readers organized by Carrie. Some of Carrie's success stories: The assembly and indexing of approximately 150 scrapbooks containing the queries and answers from the Hartford Times and the Boston Transcript; copying at least 8 of the cemeteries in the Spokane Rural Cemetery volumes, copying and publishing Whitman, Lincoln Adams, Pend Oreille and Stevens County cemetery records; copying and publishing Books A and B of Spokane County Marriages; publishing the holdings in the genie room of the library; preparing numerous index cards for the Patchen file; indexing books written by other members; compiled two or three books on her own families; and doubtless other efforts which do not come to mind at the moment. In addition to the above, Carrie is a Life Member of the Society, has been President(1956-1957), Treasurer, Librarian and Trustee. She has served as a library helper and project chairman. Weston Lartigue died July 18, 1975 and Carrie died September 9, 1990 and Find a Grave has their tombstone picture. Editor Note: Carrie Lartigue was probably the second most important President of EWGS; as you can see she did a lot of projects to help EWGS and other members. This is the twelfth in the series on the Presidents of EWGS leading up to the 75th anniversary in 2010. See the previous posts on Samuel Pool Weaver, Leora Cookingham Thiel, Susan Marie West Jack, Ruth Churchill Austin, Alfred Denman, Florence Ballou Brown, Harriet Jefferson Pinkham, Mary Elizabeth Dow Maltbie and Achsah Maltbie Rawlings, Lee DeGolyer Patchen and Susie Elliott Faubion. Edith Webb Nelson was EWGS President in 1954 and 1955. 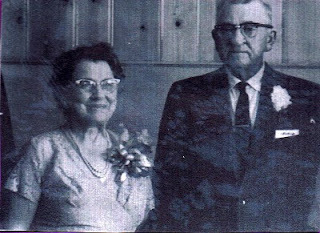 She was born December 12, 1885 at Frankford, Missouri, daughter of Elisha Alexander Webb (1855-1939) and Sarah Ann Keeler (1858-1920). Both of her parents are buried in the Hartline Cemetery. The Webbs were from Virginia by way of Tennessee, Kentucky and Missouri. The Keelers were from New York and eventually England. Edith was educated in Missouri and at Washington State College at Pullman. In 1911 at Hartline, Washington Edith Webb married Stuart Reeves Nelson (Edith and Stuart Nelson in picture). Edith and Stuart had two sons; Vernon N. & Norman Dennis; two daughters Ruthe Isabelle and Edith Marguerite. Edith died February 24, 1967 and is buried in Goldenrod Cemetery Tekoa, Washington. Stuart remarried after Edith's death to Margaret M. Korey May 9, 1965 at Spokane. Stuart died September 5, 1975 and is also buried at Goldenrod Cemetery, Tekoa, Washington. 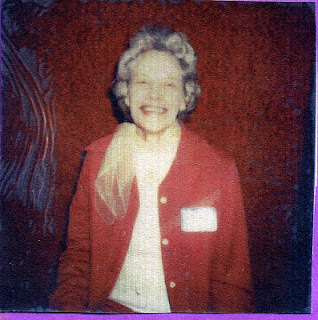 Edith had been EWGS Librarian 1948, and on the board of directors for several years. Comments by Carrie Lartigue: Edith Nelson also helped with the scrapbooks until her health began to fail. Her home was open to EWGS members for a picnic in August for several summers. Meetings have always been first Saturday of each month , September through June. These summer outings, (pot luck) brought the members closer together and was a time for sharing in reports of progress made in their search. I remember three picnics at the Nelsons, two at the Lartigues and several at the Clumpners. Edith was 81 when she passed away. If you are a Legacy Family Tree genealogy software user, or are simply curious about this genealogy software program, you may be interested in the Legacy Users Group (LUG), which will meet next Wednesday, January 13th, from 1:30 to 3:30 PM in the meeting room of the Shadle Park Branch of the Spokane Public Library at 2111 W. Wellesley. Regular attendees will take turns in the role of moderator for each meeting. If you have more questions, please contact Donna Potter Phillips here. This is the eleventh in the series on the Presidents of EWGS leading up to the 75th anniversary in 2010. 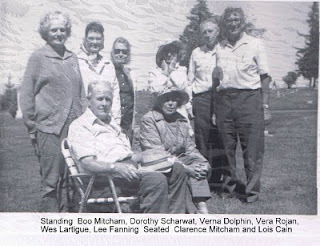 See the previous posts on Samuel Pool Weaver, Leora Cookingham Thiel, Susan Marie West Jack, Ruth Churchill Austin, Alfred Denman, Florence Ballou Brown, Harriet Jefferson Pinkham, Mary Elizabeth Dow Maltbie and Achsah Maltbie Rawlings and Lee DeGolyer Patchen. Susie Elliott Faubion was EWGS President for 1952 and 1953. Susie was born in Wheeler South Dakota in 1891 and died September 9, 1980 at the age of 88. 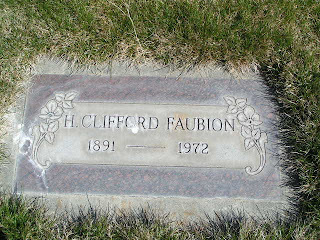 In 1917 she married Herman Clifford Faubion. He was a service station operator on Sunset Hill. There is an interesting article in the Spokane Chronicle on Clifford Faubion opposing the freeway through town. His reason is that the new freeway would bypass his service station. Clifford died March 3, 1972 and is buried in the cemetery at Hartline, Washington. I want to thank the people at Find a Grave for this photo. Susie was the daughter of Arthur M. Elliott 1858-1937 of Wilbur, Washington and Annie Tanner 1860-1896. Annie was born in Switzerland and died at Livermore, California. Susie was a graduate of Washington State University in 1916. She lived in Spokane for 58 years. Susie was Past Regent of the Spokane Gary Chapter of the DAR, Past President of the Wednesday Club, Past Director of School District #104, a member of the Friends of The Library, a member of the First Presbyterian Chirch, and President of EWGS in 1952 and 1953. Susie also was an EWGS Director, Second Vice President, Corresponding Secretary, served on the scrapbook and indexing committees, and assisted Carrie Lartigue and others indexing the Hartford Times and the Boston Transcriptions, and other scrapbooks. (Editor Note: The Hartford Times and Boston Transcripts were New England newspapers and they had a genealogy column that answered queries including sources on where to find the answers.) Susie and Clifford had three children; sons Dwain C., and Stanley E., daughter Patricia. The Bulletin volume 16 page 52 has a nice memorial for Susie Faubion "Although few current members knew her as some of the older ones will remember her, we will all be reminded of her by the services she gave to the Society in the projects she worked on now available for us all for use in our research that can be found in the Genealogical Room of the Public Library. A member who participated in the Society as actively as Mrs. Faubion did is sure to be missed by us all." 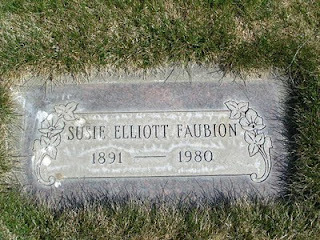 Susie was also buried in the Hartline Cemetery. Again thanks to the Find a Grave people. Comments by Carrie Lartigue: Mrs. H.C. (Sue) Faubion was a rather shy lady who preferred to stay in the background.. her deeds were kept at a low profile. During the years of the big "Scrapbook Project" she met with us faithfully each Tuesday and worked from 9 am to 3 pm...made gallons of paste and furnished cash to purchase part of the 150 scrapbooks needed. We lost a good friend when Sue died. It was during her administration that I (Carrie Lartigue) became a member of EWGS. First Ever Genealogy Podcast App for iPhone/iTouch Now Available! SAN RAMON, Calif. – January 4, 2009 - The Genealogy Gems Podcast, the #1 podcast in the genealogy category in iTunes has launched the first ever genealogy podcast app for iPhone and iTouch (in partnership with Wizzard Media). The Genealogy Gems Podcast app provides users with streaming genealogy audio and video on the go, and exclusive Bonus Content. A free “online genealogy radio show,” The Genealogy Gems Podcast has provided innovative research strategies, family history expert and celebrity interviews, and genealogy news since 2007. These “gems” of genealogical information inspire family history researchers of all experience levels and helps them make the most of their valuable research time. The new app provides one more way for the popular podcast to reach it’s worldwide audience. The app streams all the episodes (including show notes! ), and new episodes are downloaded automatically. Bonus content on the new app includes exclusive material such as audio files and custom genealogy themed wallpaper, as well as Cooke’s 20 page pdf e-book 5 Fabulous Google Research Strategies for the Family Historian. New bonus content will be added as episodes are published. Cooke says users have much to look forward to, “There’s always something new coming to your iPhone and iTouch with the Genealogy Gems Podcast app! Genealogy Gems is one of the leading producers of online quality genealogy-related media. Also found at the Genealogy Gems Web site http://www.GenealogyGems.TV , recognized as one of the 101 Best Web Sites for Family History 2009: The Family History: Genealogy Made Easy Podcast, the Genealogy Gems TV Channel at YouTube, the Genealogy Gems News Blog, Genealogy Gems Premium Membership including exclusive podcasts and videos, and The Genealogy Gems Podcast Toolbar. Lisa Louise Cooke is the author of Genealogy Gems: Ultimate Research Strategies, and national genealogy speaker. She also produces and hosts The Family Tree Magazine Podcast, teaches online webinars, and writes and produces videos for the magazine.